Operations Manager is a position with diverse areas of responsibility. Richard Lind is responsible for accounting, the financial side of parish operations, and overseeing parish facilities. Staying in compliance with Diocesan requirements requires him to work closely with staff and ministries. As Administrative Assistant she has a multitude of duties. She greets and assists visitors, answers incoming telephone calls and has deadlines to meet. Often all at the same time. She schedules funerals, weddings and baptisms, sets appointments, conducts the Baptism Class and insures a proof read and publication ready bulletin is off to the printer on time. 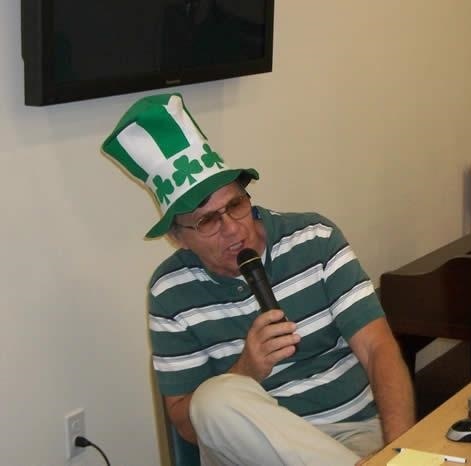 Tom Moline is responsible for entering all information related funds coming into the parish. Data entry includes New Family Registrations, parish ID and envelope numbers. He is a Sacristan, Extraordinary Minister, member of the Liturgical Committee and oversees the training of Altar Servers. Coordinator of Religious Education (CRE), David Collins cares for the needs of children and adults who participate in the Faith Formation programs. As CRE, David is responsible for directing the team of volunteers who generously give of their time and talents to serve the families of the parish. 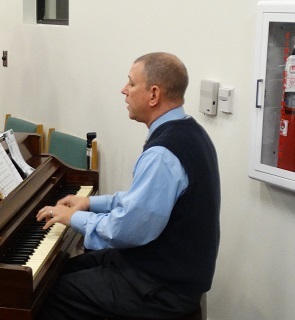 As Music Director, David sings, plays the music and oversees the choir. Ernie Nolder describes his job responsibilities as "to maintain the grounds, buildings and computers." The position also includes "odd jobs and swapping." Ernie is assisted by co workers: Chuck Deitzel and Roger Rodriguez. As Liturgy and Worship Director Lydia Herrera has an enormous responsibility overseeing the daily Liturgical operation of the church. All masses; Daily, Sunday, funeral, wedding, baptism or any other worship service that pertains to the Liturgy are in her capable hands. Along with a group of volunteers, she sets up the big hall in the Cabrini Center for Family Mass and extra Masses at Christmas and Easter. Father Cogan is a priest of the Diocese of Venice and was ordained to the Priesthood on October 25, 2004. He most recently served as Parochial Vicar of St. Leo the Great in Bonita Springs. prior to that, Father Cogan served as Parochial Vicar Of St. Charles Borromeo Parish, Port Charlotte, ss. Peter and Paul the Apostles Parish in Bradenton, San Pedro Parish in North Port and St Ann Parish in Naples.